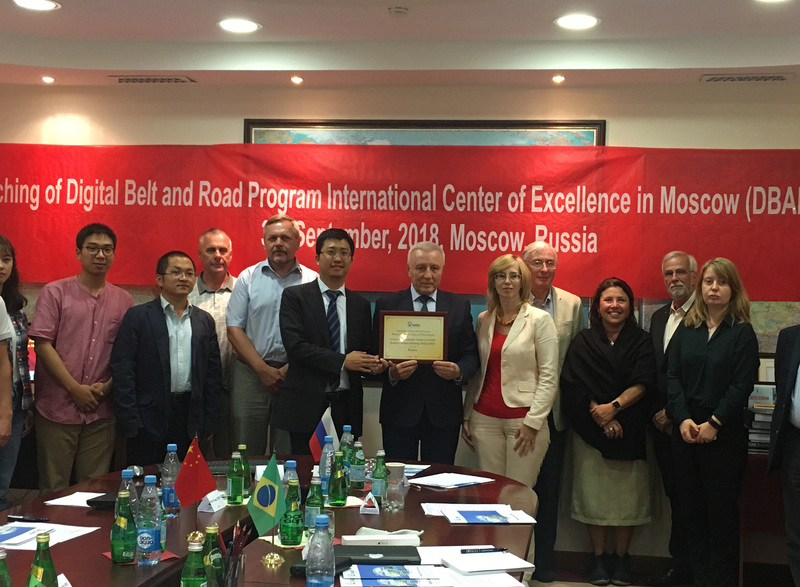 The inaugural meeting of DBAR International Center of Excellence at Moscow (ICoE-Moscow) convened in Moscow, Russia on September 4th, 2018. The construction of DBAR ICoE-Moscow is an important component of DBAR of "Big Earth Data Science Engineering Project (CASEarth) " which is A-type strategic pioneering science and technology project of the Chinese Academy of Sciences. DBAR ICoE-Moscow, is one of the eight DBAR international centers of excellence in Asia, Africa, Europe and North America, hosted and operated by Russian Institute of Space Surveillance Science, under the leadership of Academician Valery Bondur as the Director of the Center. DBAR ICoE-Moscow will facilitate DBAR's cooperation with Russia and Eurasia in Big Earth Data science; support the construction of the Ice Silk Road and the realization of the UN sustainable development goals (SDGs) in the Eurasia region. ICoE-Moscow has committed to provide support to enable science and technology and Big Earth Data solutions towards UN sustainable development goals of zero hunger, sustainable towns, climate change, in protecting terrestrial ecology around forest fires, agricultural droughts, urbanization assessments, and polar environmental changes for the Eurasian region. They will work in close collaboration with DBAR's Natural Disaster, Agriculture and Food Security Working Groups, with support of the DBAR's Urban Environment and High Mountain & Cold Region Task Forces. A four-member delegation of DBAR lead by Professor CHEN Fang, the Deputy Secretary-General of DBAR, attended the inaugural meeting. The meeting was chaired by Valery Bondur, currently the Vice President of the Russian Academy of Sciences, foreign academician of the Chinese Academy of Sciences, Director of the Russian Space Surveillance Science Institute and Deputy Director of the Institute of Soil Science in Dokuchaev, Russia. Igor Savin- Communication academician of the Russian Academy of Sciences, Professor Vladimir Tikunov-director of the Regional Center for Data Systems at Moscow State University, Professor Paulo Menezes-former vice-president of the international association of cartography were also among the prominent participants of the meeting. In his speech Academician Valery Bondur, welcomed the DBAR delegation's visit and expressed hope that DBAR ICoE-Moscow will bring together scientists from Russia, central Asia and eastern Europe to collaborate on research towards utilization of Big Earth Data to aid mitigation of natural disaster risks, support sustainable urban development, and improve agricultural capacity and food security to realize the UN sustainable development goals in the region. He also introduced the work plan and operations of the center. He expressed commitment towards scientific data sharing, cooperation in results publication, talent cultivation and communication to arrange field deployments. During the meeting, Professor CHEN Fang introduced the overall framework, progress and operation mode of DBAR ICoE. He emphasized the importance of Big Earth Data for synergistic analysis to realize integrated digital representation of Earth based on multi - source data, necessary to support interlinked sustainable development goals in the Belt and Road region. Through the implementation of the DBAR plan, experts are hoping to support decision-making process for SDGs. He expressed that DBAR is working to make the Big Earth Data information mining a main tool to integrate monitoring, experiment, analysis and simulation data to support multidisciplinary research on natural resources, ecological environment, climate change and disasters, and social economy in the Belt and Road region. He further iterated that as a key scientific center located in the central Eurasian region, the operation of DBAR ICoE-Moscow will help to improve the big earth data support for regional natural disaster response, urban sustainable construction, polar environmental management and navigation channel protection. He hoped that DBAR ICoE-Moscow, will provide foundations for joint research, scientific and technological cooperation towards mutual benefits. The meeting also focused on regional services and development of DBAR ICoE-Moscow. The center has prioritized capacity building through education, training and personnel exchange visits. It will also work to utilize Belt and Road Big Earth Data platform to enhance the sharing of cooperative research data. The center also has plans to arrange a symposium during the 3rd Digital Belt and Road Conference in Tengchong, Yunnan in December 2018, in order to gather scientific consensus and develop cooperative networks and resources for the SDGs indicator monitoring along the Ice Silk Road.